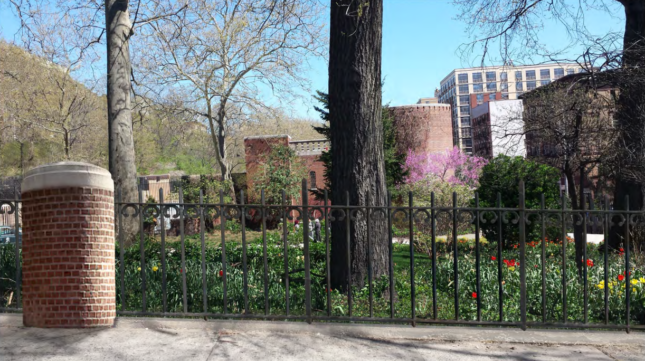 What is happening to these landmarked fences in Jackie Robinson Park? - Archpaper.com What is happening to these landmarked fences in Jackie Robinson Park? On the Fence About It? 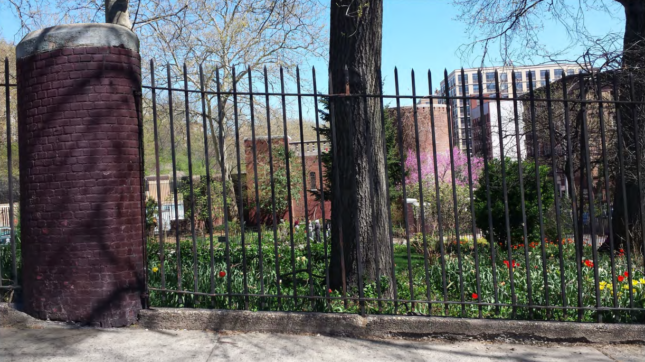 What is happening to these landmarked fences in a Harlem park? The Landmarks Preservation Commission (LPC) this week approved a Parks Department plan to renovate a historic park, but proposed replacement of tall art moderne fencing with a shorter new fence—in keeping with an initiative to make parks more welcoming—was vigorously debated by commissioners and members of the public. to spruce up Jackie Robinson Park in West Harlem. The 13-acre greensward, once called Colonial Park, hugs Bradhurst and Edgecombe avenues between West 145th Street and West 153rd streets. Its rolling hills host a swimming pool and bathhouse at its southern end, one of the city’s 11 WPA-era pool complexes and the only one built in a minority neighborhood. Designed by Aymar Embury II and Henry Ahrens, architects who worked under then-Parks Commissioner Robert Moses, the Jackie Robinson Play Center, built between 1935 and 1937, is art moderne through-and-through, with its simple brick massing anticipating the work of Louis Kahn. The pool and park perimeter are encircled by fencing; the most distinctive barriers are thin steel posts set between brick piers that match the bathhouse facade. The Parks Department would like to replace those landmarked fences with shorter ones, in keeping with Parks Without Borders, a new program to make parks more open and visually appealing. That program launched in 2015 with eight parks in the five boroughs selected for improvement the following year: Communities nominated parks for facelifts that could include lowering tall perimeter fences or removing them entirely, opening up narrow entrances, and building curb appeal in park-adjacent spaces. 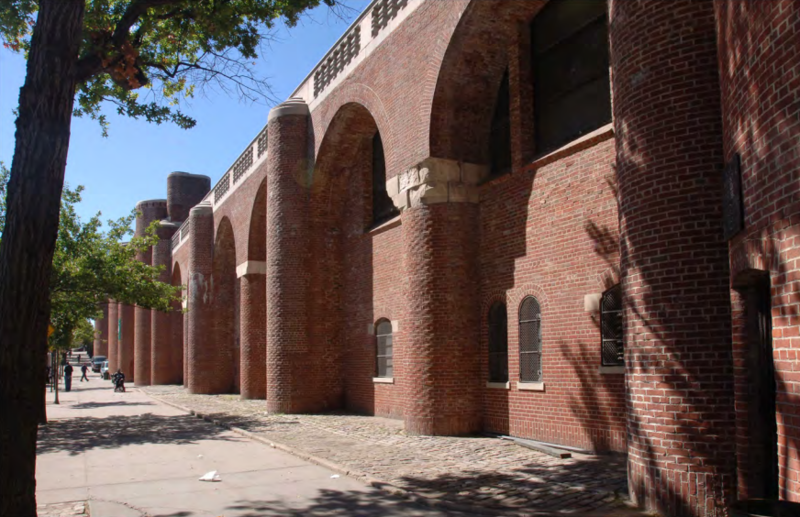 At various points in her presentation to Landmarks, a Parks Department representative called the entrances “unwelcoming” and referred to the fences as “giant,” “heavy,” “fortress-like,” and “harsh,” but acknowledged that the piers’ brickwork matches the bathhouse. The Parks Department wants to remove the eight-foot-high perimeter fence at the southern border, which is bent and broken in places, and replace it with a four-foot-high barrier whose decorative elements borrow from fences elsewhere in the park of an earlier vintage. The agency also raised the possibility, based on its own research, that the southern fences were added at a later date (though the LPC designation report ties their to the construction of the pool and bathhouse). This project would come out of the almost $5 million in capital funds the city has allocated to carry out planned repairs, but that funding is not yet secured. Manhattan Community Board 1o reviewed the plans and supports the proposed changes. The fences were the subject of intense debate at the hearing, with members of the public and some commissioners voicing concern that the proposed fencing just doesn’t harmonize with the surroundings. “This would be like replacing moderne windows with Victorian windows in an art deco building,” said Patrick Waldo, reading a statement from preservation group Historic Districts Council (HDC). Reducing the height of the piers without reducing their width, HDC argued, would look strange and not dialogue appropriately with the monumentality of the pool complex. The group’s statement noted that the wrought iron fence, which borrows from another park fence of a different era, is “stylistically inappropriate,” adding that the complex is akin to a total development like Rockefeller Center; changing the details by stretching or shrinking them would compromise the overall design. In his testimony, landscape architect and preservation consultant Michael Gotkin called the fence replacement an “empty gesture.” Gotkin, a longtime resident of the Upper West Side and West Harlem, believes that instead of the Parks Department addressing issues like inequality and disinvestment that prevent access to parks, the fences are being lowered for symbolic reasons. By the same logic, his testimony doubted whether the agency would lower Central Park’s imposing Vanderbilt Gate or the tall wrought iron fence around the East Village’s Stuyvesant Square. “We deserve as much preservation as rich neighborhoods,” he said. After the hearing, historian and Harlem resident Michael Henry Adams highlighted a subtext to the planned changes in a historically black and rapidly gentrifying neighborhood where the median annual income hovers around $36,000. “It’s just nutty to be talking about these airy-fairy things of making the park more welcoming for affluent white people when to do that, you are diminishing and altering an individual landmark. I think that’s wrong.” Adams has chronicled Harlem in two books and to works to preserve its history with Save Harlem Now!, a group he co-founded. The Landmarks commissioners, too, had conflicting perspectives on the fence replacement plan. Commissioner Diane Chapin noted that ideas around how the perimeters of parks should look are always in flux, she was not convinced on the appropriateness of a more ornate fence. Her colleague Michael Goldblum asked if there were other options: Could the piers stay and the fences be lowered? Lower most of the pillars but leave the ones near the entrance intact? “It’s within preservation ideology and philosophy to make some changes along the perimeter and not be [a] slave to every possible historic aspect,” said LPC Chair Meenakshi Srinivasan, a statement with which Commissioner Frederick Bland agreed. Sybil Young, a Parks preservationist, requested approval from the Commission in light of the fact the project’s funding remained undecided. Chair Meenakshi Srinivasan assented and the commission agreed it could approve the work, among other requested changes. If and when the Parks Department has the capital funding for the new fences, it can go back to the LPC for discussion. An LPC spokesperson said that if there is significant new information the commission may hold an additional public meeting. A Parks Department spokesperson said that right now, except for work at the two southern entrances, the agency does not have funding or LPC approval for a new southern border fence or money to reduce the height of the piers. The agency is not actively seeking funding for the southern border portion of the project.